Former Interns Jake Fowler and Muriah Bottemiller get ready for action! Photo by Mike McMahon. 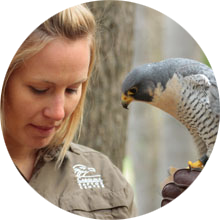 Want experience working with kids, in non-profit management, rehabbing raptors or inspiring visitors? 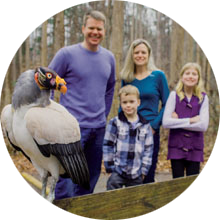 Carolina Raptor Center offers internships throughout the year. We encourage college students to apply to these opportunities, especially if you are pursuing a career in biology or animal management. Pre-veterinary students or vet tech graduates are encouraged to apply to our rehabilitation internship. Elementary educators or students can gain specific experience working with kids and teaching to an environmental education curriculum written especially for our summer camp program. 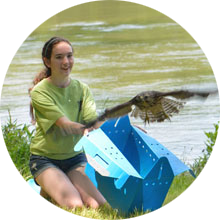 Avian Education and Keeper Interns participate in the day to day care of Carolina Raptor Center’s ambassador birds and conduct education programming. More info. Summer Camp Interns lead our Raptors Rock summer day camp. Educating and inspiring ages 6-14 in various different weeks of summer camp including: Young Vets Camp, Keeper Level Camps and our Raptor Rookies Camp. This is a summer only internship. More info. 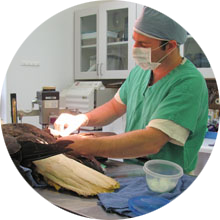 Rehabilitation Interns work alongside our staff to provide medical care to the 800-1,000 raptors a year that visit our Raptor Medical Center. Available year round. More info.